12 Amp Wireless Remote Power Controller. Single Port. 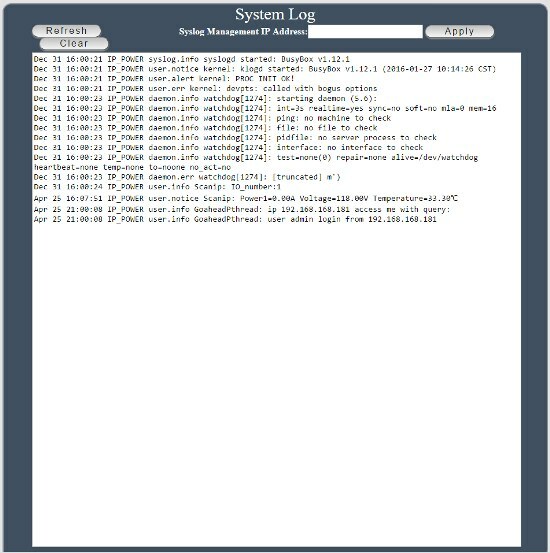 SysLog – The System logs activity on the RPS device. The data can be sent to a syslog server by filling in the IP address of the server and clicking apply. Note that the log file is deleted after the RPS unit is power cycled. Firmware Updates – updates are only supported using the LAN connection. Updating over the WiFi will cause system failure. It takes about 1 minute to perform the firmware upload. The system needs another minute to boot up. 1) Turn off all chat programs such as Skyle, FB, QQ, AIM, Yahoo Messenger etc. 2) Make sure the device is functioning correctly and the power cord is secure. 3) While updating do not turn off the power and make sure the LAN cable is connected securely. 4) If you interrupt the update process, the rps unit will be corrupted and unusable. 5) Turn off any AntiVirus or Spyware prevention software. 6) You can only update the firmware over the LAN connection. 7) A 32bit web browser must be used. A 64bit browser will corrupt the update and leave the unit unusable. 8) The unit must be set to use port 80. 9) After the update file is accepted by the remote power switch, you must reboot the device and do a hardware reset by pushing the reset button for 10 seconds. 10) To view the update on your web browser, empty the cache and clear the cookies on the browser. To Enable the remote : Press the power button one time while pointed at the RPS-NODE-9255Wifi unit. If accepted, the RPS unit will return a short beep. 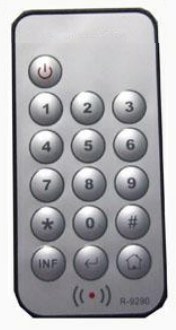 To Disable the remote: Press the power button one time while pointed at the RPS-NODE-9255Wifi unit. If accepted, the RPS unit will return a short beep. To Control the Power: Press button #1 to cycle the power.